This month’s “Why Movement Matters” theme has got us talking a lot about the fuel that actually gets us moving. Yes dark leafys are important. Whole foods are a must. And, water. Water is critical before, after and during exercise. It flushes out toxins from our guts and skin. It transports nutrients in the body and helps us to absorb them, supports daily digestion, regulates body temp and so much more. But who’s with us — water can sometimes feel a bit snoozy or taste a bit harsh. So what if we told you that dressing up your workout H20 could actually provide additional health benefits like increased hydration, detoxification and better workout recovery? Sea Salt in your water. All day every day. We swear by it for those with sluggish adrenals or those that are in need an energy boost throughout the day. High quality Pink Himalayan Sea Salt is the greatest electrolyte on the planet and contains the same 84 trace minerals and elements that are found in the human body, including sodium chloride, sulphate, calcium, potassium, and magnesium. These essential minerals aid in proper metabolism functioning, improve digestion nutrient absorption, balance the body’s pH, and help to hydrate more quickly and effectively at the cellular level. Next time you fill your water bottle in prep for movement, add 1/4 teaspoon of sea salt and shake, shake, shake! *Note that quality is important here. True Himalayan salt is sourced from 200 million year-old sea beds, it’s free of the heavy metals and toxins that show up in sea salts harvested from today’s oceans. We love this brand. Activated Charcoal can be proudly found on our Shop Good shelves in masks, tooth powders and scrubs. We swear by it in our water for workouts too! AC works by swooping up and trapping toxins in its porous texture. But contrary to common belief, AC doesn’t absorb toxins, however it adsorbs, a chemical process where elements actually bind to a surface, rather than being soaked up and assimilated into the blood stream. During exercise movement, the increase of heart rate and circulation will naturally move stagnant toxins and release them into the blood stream. Activated Charcoal can act as a carrier of these toxins out of the body, which makes it a perfect water additive while getting your sweat on. We’ve also noticed immediate skin benefits: as toxins move more efficiently out of the body, the more effortlessly the body can process any residual toxic or hormonal stagnation before it shows up on our chin and cheeks in the form of acne. To craft your Charcoal Cocktail, open one full capsule (we love this brand) and dump directly into your bottle of filtered water. Sip throughout your workout routine. **Note that Activated Charcoal should be taken away from any other supplements or prescription drugs, as it has the ability to inactivate. It is also extremely important to drink water with AC to avoid the bound toxins to become stuck in the system. During exercise, electrolytes in the body are lost via sweat and must be replaced to rehydrate the body to avoid muscle cramping, stiffness, headaches or post-workout irritability. 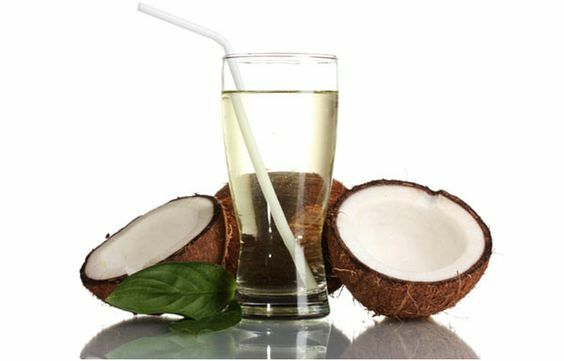 Coconut water is an incredible source of the body’s main electrolytes including sodium, potassium, chloride, calcium, magnesium, bicarbonate and phosphate. BONUS, coconut water is an incredible skin food too, regulating the body’s response to inflammation and keeping skin plump and supple while reducing signs of aging. Finally, it contains Vitamin A, Vitamin C, proteins, iron and calcium, making it a complete nutrient package for the body. Ok, if you’re not sold yet, try mixing 3 parts water 1 part coconut water in your next workout beverage and you’ll be asking for round two before spin class is even over. *Note that (of course) quality is important here as well. Look for organic coconut water that have the most simple of ingredients (i.e, just the coconuts, no additional flavors or sugars added! Bartender, I mean Barre Instructor! I’ll have another super-charged water, please! Try any of these workout cocktails? Comment below to let us know what you think!